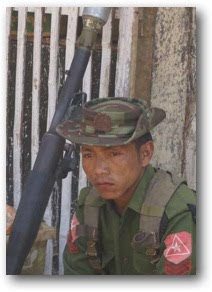 While we work in a very volatile region, wheresocial unrest and violence are not uncommon, tensions that we hoped would be resolved diplomatically have reached a boiling point and may quickly develop into a full-blown war between the Burma Army (the ruling military junta) and four ethnic groups: the Wa, Kokang, Kachin and Shan.The Karen have long been fighting with the Burma Army as well, but thepresent conflict is unique in the region’s history because it is the first time the tribes have united against the Burmese military regime. This region is very complex, and it is extremely difficult to predict an outcome.The best-case scenario would be that the junta would recognize the difficulty of subduing the united resistance front and negotiate semi-autonomous regions like China did decades ago in Yunnan.The worst-case scenario would be a bloody war where thousands of people die, including many innocent women and children.We certainly hope for a peaceful resolution, but with the way things are going, we have to prepare for the worst on the ground. Some of our homes in the region are at risk of the army conscripting our staff and/or forcing the re-conscription of the children in our care.Our team and partners are currently creating a contingency plan to evacuate staff and children who would be targeted for conscription. This is a time when we need people to rally together to support the innocent lives that are in immediate danger.If you have ever lived through any type of armed conflict, you know what a nightmare it is.Our mission at present is to help in every way possible to avert tragedy, and it unfortunately takes substantial funds to move refugees and provide aftercare to people affected by conflict.Please consider making a donation through facebook or our site: www.projectAK47.com or do your best to find another organization that can get immediate help to people in these areas.